?uestlove has been singing the praises of Twitter. Well, it's not surprising he's a fan really when you consider he has more than one million followers on the addictive social networking time consumer. 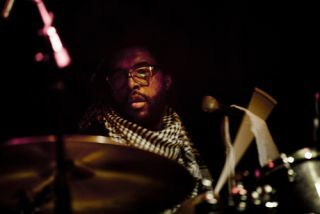 The ridiculously-talented Roots drummer told the Wall Street Journal that his Tweets have changed people's perceptions of him. He said: "Twitter and the show made it easier for us to be more human. In the first three months of being on Twitter, a lot of the reaction was 'Yo dude, I never knew you had a sense of humour or that you liked to make fun of yourself so much.'" ?uestlove isn't the only drumming heavyweight on Twitter, Aerosmith's Joey Kramer, Mike Portnoy and (for those not easily offended) Steel Panther's Stix Zadinia are among the hundreds of well-known sticksman with an account. Of course you can also follow Rhythm on Twitter and by doing so you'll find out all of the latest drumming news, interviews and features. And we'll occasionally also talk about what we've had for lunch.